In many cases, you don’t want to put a permanent sign in your lobby. Banner stands are a great way to solve the problem. They don’t require any fixtures, the maintenance department doesn’t need to install them, and when you want to remove them, it takes about a minute. If you decide it will look better in a different spot, you pick your banner stand up and move it over. Best of all, they are cheap! 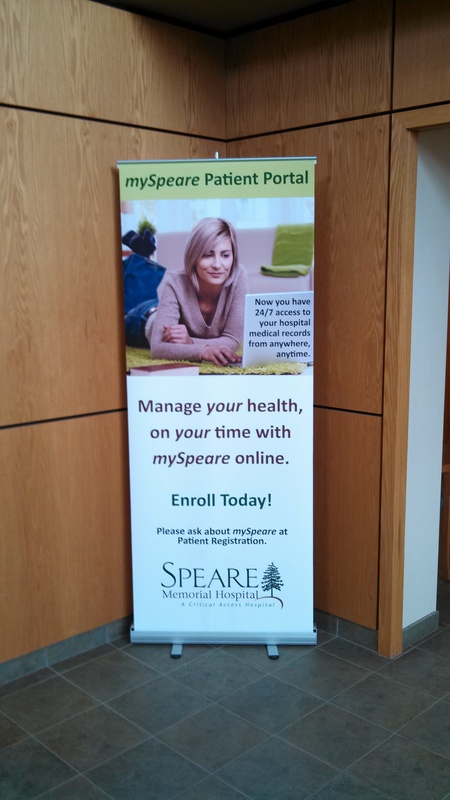 This banner stand that we made for the local hospital cost them $199. We can do a banner stand for you for the same price! Banner stands are also great promotions and events. They are up for a time, and then they go away cleanly. We can replace the graphics with the announcement of your next event. This entry was posted in Banner Stands and tagged banner hanging, banner stand, temporary signs. Bookmark the permalink.